Our high quality original designs printed on 100# uncoated card stock will be an excellent addition to your photo booth prop kit. Your guests will love posing with these signs, creating a fun and memorable experience for all. 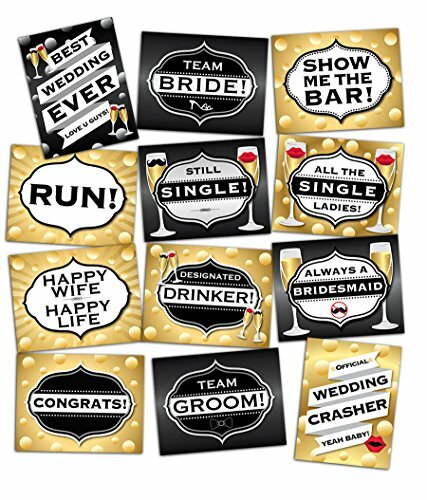 The kit includes 6 doubled-sided cards with an original design on each side for a total of 12 designs: Team Bride, Team Groom, All The Single Ladies, Designated Drinker, Best Wedding Ever - Love U Guys!, Official Wedding Crasher - Yeah Baby!, Always A Bridesmaid, Still Single!, Run!, Show Me The Bar!, Congrats!, and Happy Wife Happy Life. If you are looking for a fun and unique way to engage your guests, add to cart now! ✸ 12 ORIGINAL DESIGNS ✸ Create great memories with these unique, fun designs that provide an expression for everyone at your wedding. ✸ HIGH QUALITY CARDS MADE IN THE USA ✸ Our signs are 8.5" x 11" printed on durable uncoated 100# card stock that reduces glare produced by flash photography. ✸ DOUBLE-SIDED FUN ✸ One unique design is printed on each side of the 6 cards providing 12 different expressions: Team Bride, Team Groom, All The Single Ladies, Designated Drinker, Best Wedding Ever - Love U Guys!, Official Wedding Crasher - Yeah Baby!, Always A Bridesmaid, Still Single!, Run!, Show Me The Bar!, Congrats!, and Happy Wife Happy Life.  NOW LET'S CELEBRATE  This photo booth prop kit includes humorous and celebratory expressions to help capture the fun and excitement everyone at your wedding will have. Simply add to cart so you and your guests can grab a sign and strike a pose! ✸ 100% SATISFACTION GUARANTEE ✸ If you are not satisfied, we are not satisfied thats why your purchase is protected by a 100% satisfaction guarantee. We are dedicated to providing a 5 star experience for all our customers. If you have any questions about this product by Envisage, contact us by completing and submitting the form below. If you are looking for a specif part number, please include it with your message.